today we only got a couple of tomatoes so I could make my 6 fruit marmalade tomorrow. It looks like a couple more okra will be ready tomorrow plus a couple of good sized bells and a few more beans. I don't think we will get any more tomatoes for a day or two. 6 fruit marmalade, didn't hear of that before care to share the recipe with us. 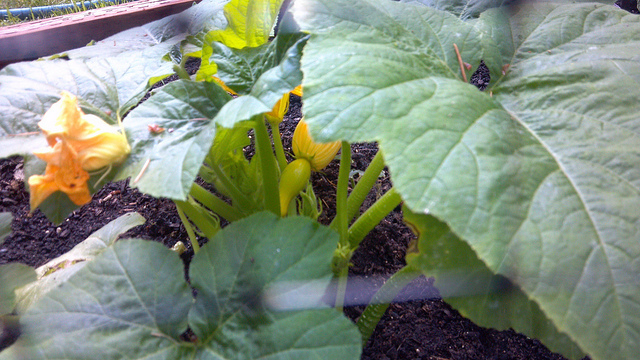 Still just spinach and peas, but the first crookneck any day now. Fresh Basil mixed with tomatoes, garlic, and olive olive over grilled chicken....yum! I will later today and it is absolutely wonderful. It is my favorite jam. I just put on a big pan of fresh picked green beans! don't hold on well so they are mostly on the ground until I water and put them back up. This is on one of their better days. Thank you but I can't blow up your picture. No matter what you say..yoours look much neater than mine. I'll have to get a pic of my wild things, lol. Ok Happ, since you mentioned it, I'll quarter a zucchini lengthways (after washing it off first, of course) and cut into slender pieces, no more than an eighth of an inch thick, add three yellow squash, cut the same as the zucchini, finely chop up one medium sized red onion (have half a row of 'em) and de-seed and thinly slice one poblano, cook in olive oil until just tender (a little salt doesn't hurt but don't go overboard) after everything is soft and the onions clear, add 2 tbsp of real butter, stir everything around in the butter and serve. I almost forgot to mention, I picked my first 4 cantaloupe this morning, was going for tomatos and the smell of ripe cantaloupe was overwhelming.....dang!! !the one I ate was GOOOOOD! Sold three to a local market that has been selling my stuff all season thus far, still have two more in the fridge. Am waiting impatiently for the stems on the watermelon to turn brown. Won't be long now! !